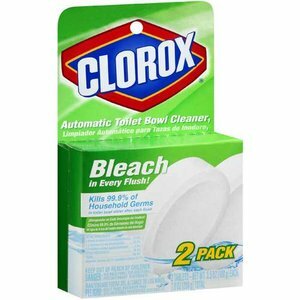 Nancy shared her Clorox Automatic Toilet Bowl Cleaner review. I have been having a problem with my toilet leaking/running. The plumber came over and said DO NOT USE bleach tablets that you drop into the tank. They eat away at the rubber flapper and cause the water to leak. He said it is best to use something that hangs over the bowl and does not touch the tank water. For those not as familiar with this product, the idea is that you drop one of these tablets, which contains chlorine bleach as one of its active ingredients, into your toilet tank and it will sanitize, deodorize and keep your toilet clean until it dissolves. The advantage many people see to using an automatic product is not having to actually scrub your toilet on a regular basis, such as with a toilet brush and liquid cleaners. Unfortunately, I have heard similar warnings about some of these drop in products. Apparently the bleach cleaner really concentrates in the tank and can react negatively with some of the parts, especially rubber as Nancy mentioned. Just think about it -- you know how the elastic in your underwear starts to fray after being washed with chlorine bleach several times -- same principle, but it is the parts of the toilet which can lead to leaking and other problems. In fact, the FAQs for the product warn that the tablets should not be used in toilets that aren't flushed at least daily, I presume because of this exact issue. These products have been on the market for quite a while though, so even though Nancy has discussed, perhaps you've not had a bad experience. I can see how not scrubbing a toilet would be a very good thing, after all. If you've used this, or any other toilet bowl cleaner of any variety, especially an automatic one, I'd love for you to share your review of it with me. You can share your review here or read other reviews, for lots of brands and varieties, that have already been submitted by other readers.